A midweek sell-off hit leading stocks hard, and put the general markets below key support levels. Indexes recovered some of those losses by Friday's close, keeping the overall outlook intact. 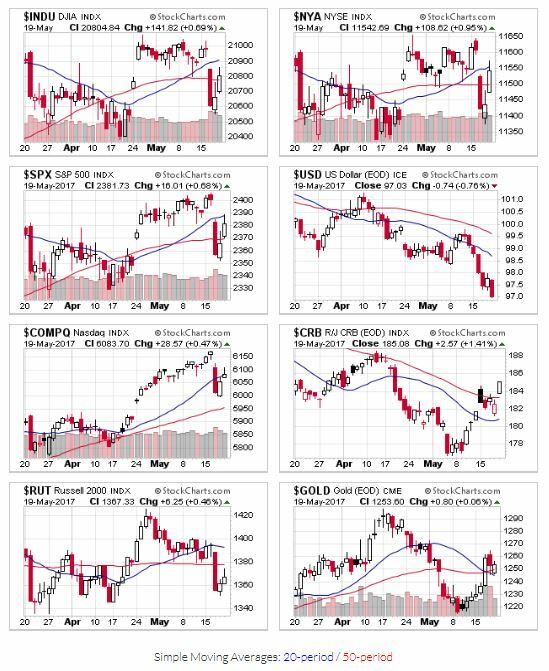 Stock indexes recovered some of their losses, and most begin this week above their 50 day moving averages, but below their 20-day. The Russell 2000 sits below both levels, reflecting the difficult week for small cap stocks. Price/volume remains in an uptrend, although another steep sell-off through the 50-day moving average would change this view. Currently, the Dow, Nasdaq, S&P500 and NYSE sit at 5, 3, 5, and 4 distribution days, respectively. OEW remains in an uptrend, and looks for strength from the Dow and S&P to continue the current rally.